VIPOW Battery is certified by ISO9001: 2000 and has passed all necessary quality certification such as CE and UL. Moreover, the company has made a great progress in the development of environmentally friendly batteries and owns a RoHS certification. The company has won a number of loyal customers worldwide and has an excellent reputation for its premium quality products, wide range of items and uncompromising service. 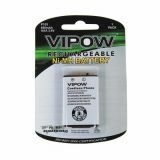 VIKIWAT Ltd. is an authorized distributor of VIPOW Battery and offers a rich selectionof their product range. In our store you can find a variety of flat batteries, rechargeable batteries and battery chargers at affordable prices with quick delivery. 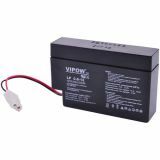 Lead-acid Rechargeable Battery BAT0221 12VDC 0.82Ah Battery pack VIPOW BAT0221, 12 VDC, 0.82 Ah lead-acid, encapsulated, non-serviceable battery with double-pin connector. Rechargeable battery with low self-discharge and long service life under normal operating conditions. Rechargeable Battery 3.6V, 60mAh, Ni-Cd Rechargeable battery with voltage 3.6 V and capacity 60 mAh. Rechargeable Battery P103, 3.6VDC, 650mAh, 3xAAA Rechargeable battery with voltage 3.6 VDC and capacity 650 mAh. The price is for 1 battery! Universal adaptor charger for lead acumulators Rechargeable batteries charger 12V 4-7 Ah. Rechargeable battery P201, 3.6V, 300mAh, Ni-CD, 2/3AA This battery has an universal connector, suitable for all landline phones compatible with this size batteries.